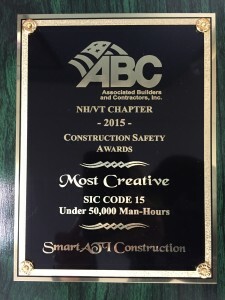 SmartATI was honored to have received the 2015 Construction Safety Award from the Association of Builders and Contractors again this year. Safety is our highest priority on any construction project. Our organization strives to promote a proactive safety culture throughout the company, and each individual is charged with individual responsibility for safety on the job. Safety on the job requires consistent effort from the top down, we understand there is always room for improvement. This is why our team is proactive in taking refresher safety courses and looking for improved ways to ensure all staff on a job are following safety guidelines. SmartATI Construction follows EM-385 Safety regulations and complies with all OSHA requirements.